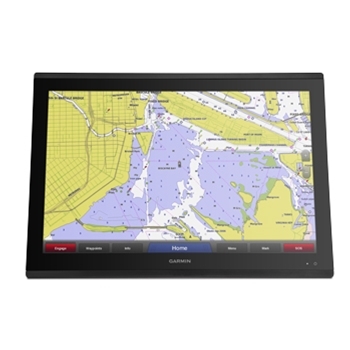 Garmin’s GPSMAP 8624 Glass Helm Chartplotter provides a crisp 24” glass display allowing viewing from all angles without distortion. 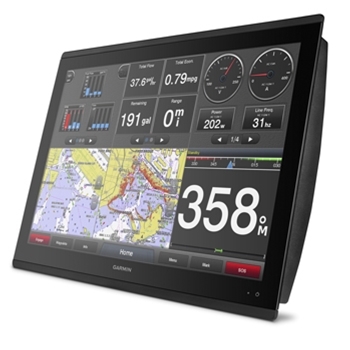 Built in Bluechart G2 Coastal and LakeVu HD Charts, HDMI Video Input/Output, Wireless Connectivity, NMEA2000, NMEA0183 and Fully Network Capable- add Sonar, Radar, FLIR Cameras, VHF, Autopilot and More! The addition of a Garmin GPS Map 8624 MFD will enhance your helm in ways you can’t imagine! Color rich 24” HD pinch-to-zoom touch glass display has an unbelievable resolution and can be flush or flat mounted edge to edge with multiple displays. The sunlight readable display can also be viewed from just about angle. Pre-loaded Bluechart G2 charting for U.S., Canada and Bahamas will take you far offshore while the LakeVu HD provides exceptional detail of over 17,000 lakes in the U.S. of those 13,000 will have HD lakes with 1 foot depth contours and shallow water shading, a handy feature that lets you set a minimum depth. Bluechart G2 gives a 2-D overhead view, and a 3-D over the bow which helps keep you oriented while viewing the screen. Either way it’s all in there! Should you ever want to do a map update, or add G2 Vision cards simply add on the Garmin SD card reader which is remotely mounted and has 2 SD card slots, and you can add on multiple readers if necessary. 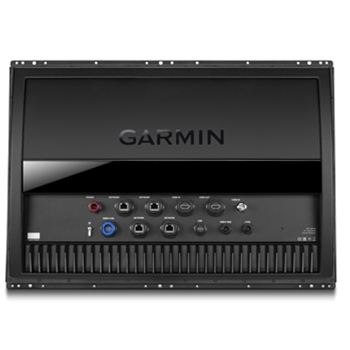 The GPS Map 8624 was designed with full system integration which offers connectivity for extras such as an Autopilot, Sonar, Marine Cameras (including the Garmin GC200),Radar, sports cameras, engine data and much more. Sync user data for anything on the Garmin network on several helms right onto 1 screen. And it doesn’t stop there- the CZone technology digital switch system will let you power on the boat if you’re on the dock, as well as pumps and control lighting (even underwater lights). Most network controls can be accessed directly at the helm, by an app on your tablet, or by a programmed remote key fob. The 8624 MFD offers a standard USB touch interface as a monitor for Windows and Mac users. Customize presets according to how and what feature you access the most and run these individually or by utilizing Garmin’s SmartMode to access several screens at the helm that are synced by your presets. FLIR Camera Support is another convenient feature offered by the 8600 series. All next generation M-series models and new digital models are supported with continuous zoom support and gyro stabilization control. Need to give your hard working MFD a rest? Expanded Sleep Mode will enable the user to turn off the backlight and sonar transmissions and can also place a networked autopilot into standby. This feature will not work if a networked unit is requiring sonar from that unit. Want to stay in touch with friends and family while on the water? Simply synch your Garmin inReach Mini Satellite Communicator with your chartplotter and select from a list of preset responses to keep your family and friends informed throughout your trip. This intuitive MFD provides the ability to utilize Axis camera support which lets the user view video on one or more screens and even view several streams on one display, all of which is controlled by the cameras pan/tilt, and pinch to zoom right from the chartplotter screen. The 8264’s superfast processing power provides seamless map draws on the display, but is also great when viewing networked devices such as Fusion-Link entertainment, radar, thermal cameras, sonar modules and more. Garmin’s powerful GMR Fantom with MotionScope and xHD2 open-arrays are compatible with the GPSMap 8624 for superb radar technology. Another added benefit of the 8624 is the Sailassist feature - This puts needs to know data right where you need it like heading, COG, enhanced wind rose, true wind data along with racing features. See true or apparent wind angle set and drift, horizontal/vertical graphs to name a few. Let the GPSMAP 8624 open you up to a whole other world - with all the user friendly technology is has to offer, the 8624 will not disappoint! FLIR Camera Support, Smart Boundaries and More!